Cardiolife AED-3100 Automated External Defibrillator cardiolife AED-3100 Simple use: This automated external defibrillator is ideal for emergency use and can be operated easily by lay people. The voice output, which was designed in line with international recommendations (ILCOR), guides the us.. 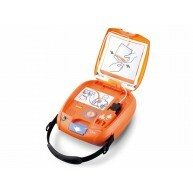 Improving quality of resuscitationSaving life, Restoring life, Sustaining life Designed for improving quality of resuscitation the TEC-5600 is a professional biphasic monitor/defibrillator supporting BLS and ALS teams in hospitals and clinics with its intuitive, fast and effective operation from early de..
TEC-8300 series Our compact portable TEC-8300 series defibrillators are ideal for emergency use. Charging and recovery are quick. These devices support AED (automatic external defibrillator) mode, and are equipped with a high-resolution TFT colour display. SpO2and CO2 measurement is supported. ..
Strong metal cabinet powder coatedDesigned for office buildings and public spacesFits defibrillators of all brandsVisual and Audible alarmsDownload a brochure >>..